During WWII my father, Ron Ford, was a pilot in the Air Transport Auxiliary, the Ancient and Tattered Airmen and sometimes Always Terrified Airwomen, who, between them, flew Anything To Anywhere including every plane which came off the production line during the war. 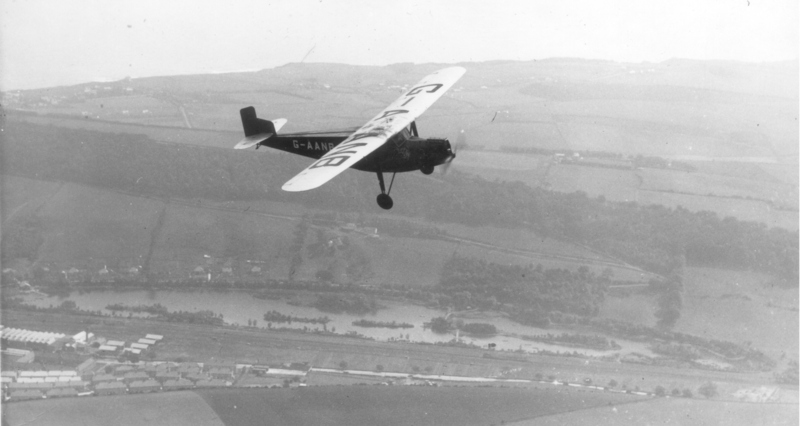 In the early 1930s, Ron’s brother Fred, older by 12 years, had begun to learn to fly, and Ron was very keen to fly too, so he would go with Fred to the aerodrome at Scarborough Racecourse and sit in a plane and imagine himself flying all over the countryside. He went to an air display at Scarborough and paid five shillings to go for a joy flight with Sir Allan Cobham. He loved it. 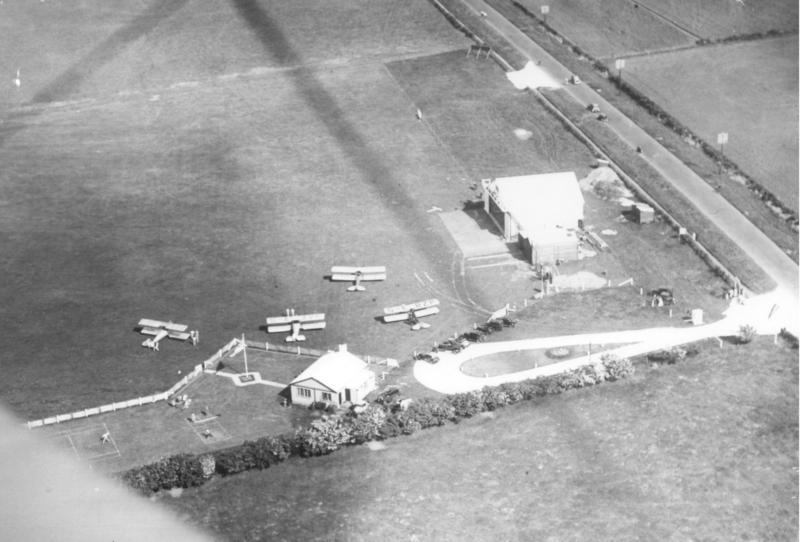 Fred, who never actually went solo himself, entered Ron in a competition with the Scarborough Aero Club whose home base moved from the Racecourse to the Ganton aerodrome, East Heslerton. The entry fee was £10 and the chief instructor selected who he thought had most potential to gain his ‘A’ licence. Ron, not the most diligent of school students, nevertheless returned to Hovingham School and asked the teacher to help him with the maths needed for the navigation and other sections of the training. On 23 August 1937 he had his first lesson in the air. It was with Commander CW Croxford at York, in a Gypsy Moth, DH 60, markings G-ABFD, HP 85 and lasted 50 minutes. His second lesson was later that day. He started landings on 25 August and on the next day, after just three and a half hours of instruction he had his first solo flight. He flew the Gypsy for twelve hours before taking control of a BA Swallow with Cirrus Minor engines. He recalled one day at the Club a plane arrived and Prince Aly Khan marched into the Club House on his way to York Races. Commander Croxford asked him if he was a member and because he was not, then asked the Aly Khan to leave the premises. Ron was amazed that such a rich man was kicked out for not being a member but penniless Ron was able to stay because he was. When he had instruction it was usually with CW Croxford, but he once had JC Bridger and another time K Maxwell. He used to recount how he often couldn’t afford the lessons and the hire of the aeroplane. When the bill arrived his father Matt would say “How much is it this time?” Ron used to mumble about “It’ll be okay, I’ll manage.” But Matt would give him the money and say “That’s the last time. No more, d’you hear? That’s the last time.” And it was until the next account arrived. Ron was awarded his Aviators Certificate issued by the Royal Aero Club of Piccadilly. It was number 15301 and dated 2September 1937. He received his Certificate of Competency and Licence to fly private flying machines on 13 September 1937. It was numbered 12900 and valid for all types of landplanes but “not for flying public transport or aerial work flying machines”. Ron was one of the first to use the Welburn Hall grass airfield and it became the Wombleton aerodrome in World War II, base for one of the Canadian RCAF squadrons. 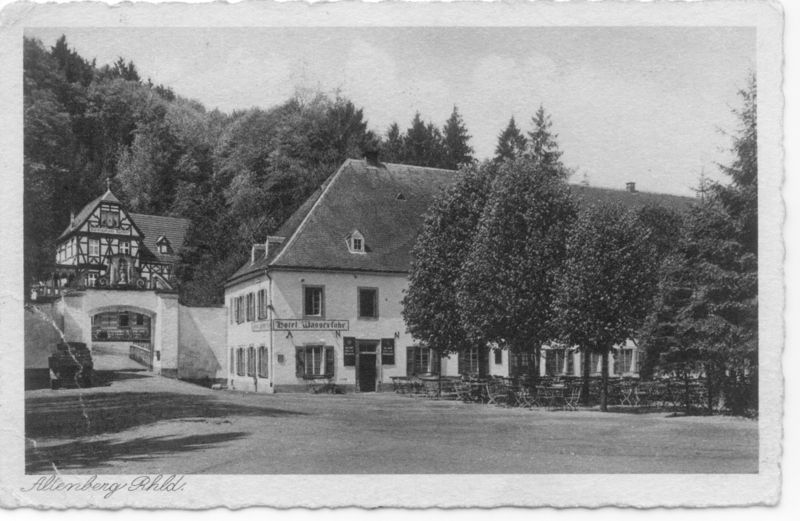 They visited Essen; saw a Nazi parade, bomb shelters and arrived back home convinced that war was inevitable. They attended a dinner in Düsseldorf and Ron recognised Ritter von Schleich, a World War I flying ace seated at the head table. He asked if he could speak with him. He remembered that both were very cagey about discussing aeroplanes and von Schleich expressed the opinion that it would be a great shame if war broke out between the two countries as they had much in common. 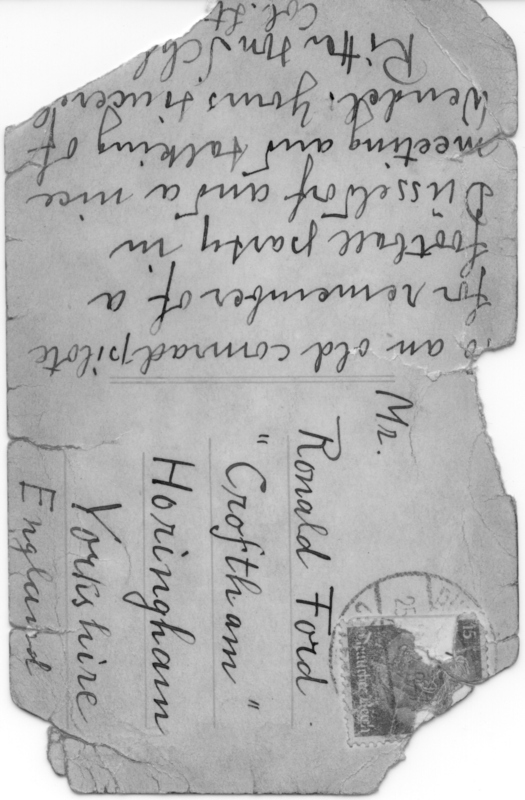 Ron must have had his pilot’s licence with him as in the back is the signature of Ritter von Schleich. Later that year Ron received a postcard from von Schleich which read “To an old comrade pilot for remember of a football party in Düsseldorf and a nice meeting and talking of Wendel. Yours sincerely Ritter von Schleich.” Fritz Wendel was the chief test pilot for Messerschmitt. 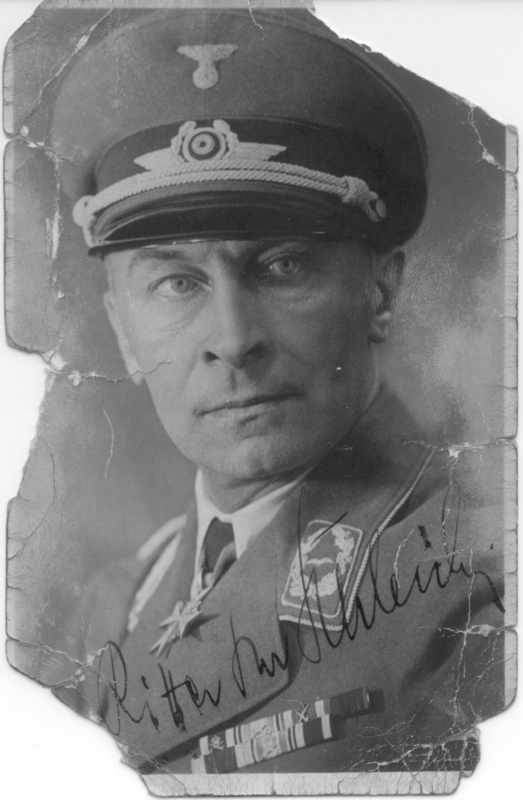 von Schleich was born in 1888 and had been awarded the Iron Cross, the Pour le Merite and the Knights Cross of the Bayern Military Max Joseph Order when he received his title of nobility. He was a devil-may-care Bavarian and a formidable opponent in the air who well deserved his excellent reputation. In 1933 he was in Hitler Youth involved in flight training and was no doubt keeping an eye on the visiting English footballers. Ron was thrilled to have met this flying legend and always spoke of him with awe and reverence. I’ve often wondered why von Schleich should have subsequently sent the postcard to Ron and the only conclusion I have come to is that it may have saved his life if he survived being shot down in enemy territory in the event of war… Ron may have been made a POW rather than executed. According to the Brighton and Hove newspaper “In August 1938 the Sussex Police met their counter-parts from Wuppertal in a challenge football match during a short visit to Hove by the German force. The game was played in a friendly and sporting manner with the local bobbies winning 3-2, but there were signs of things to come when the German party insisted on giving the Nazi salute on their arrival at Hove Station, again at the civic reception, and, as shown by a chilling photograph in the local newspaper, prior to the kick-off at the Goldstone Ground.” This is the home ground of Brighton and Hove Albion, the Seagulls football club. In July 1938 the threat of war must have been very evident. The Civil Air Guard [CAG] was formed to create a reserve of civil pilots. It offered training at aero clubs around the country and received 35,000 applications with 4000 already holding their “A” licences. Ron enjoyed learning about search-light work, sound location and armour co-op work. 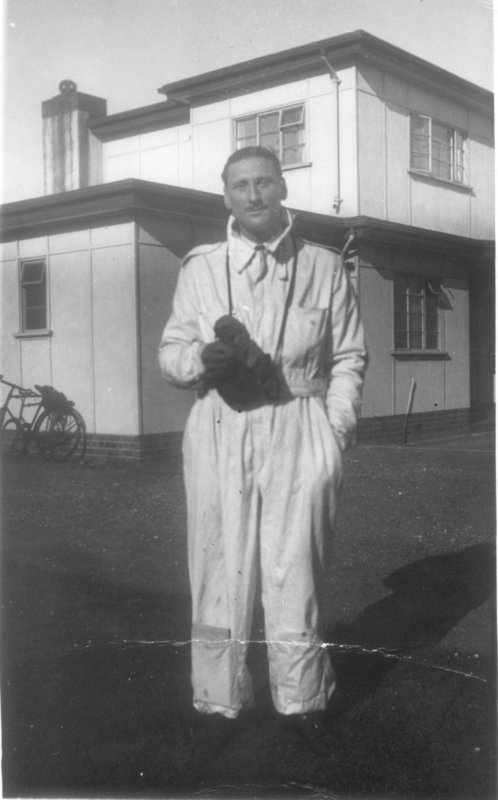 By March 1939 Ron’s increasing flying experience allowed him to venture away from the local area round York to Newcastle, Scarborough and Blackpool as he developed his cross country and navigation skills. By July 1939 he had totalled over 33 hours of flying time. He applied to join the Royal Air Force and a letter dated 14 August 1939 acknowledged receipt of his application for a short service commission. He received a telegram from the Air Ministry advising that the interview scheduled for 4 September 1939 had been cancelled because war had just been declared. “I have known Mr Ronald Ford all his life and I can testify to his excellent character. He comes from a family that bears a very respected name in Hovingham. Mr Ford is upright, presentable and athletic and has a reputation for being a very good worker. He is 27 years old and for the last 12 years he has been employed in the Motor Industry where he has assimilated a considerable knowledge of mechanics. For 4 years he has been interested in Aviation and 2 years ago he joined the Civil Air Guard. He holds his “A” certificate. However all this support came to nought for the RAF medical examination discovered that Ron had a heart murmur and low blood pressure and he was therefore classed as medically unfit to be a pilot, but he could become a radio operator, gunner or navigator. At this time Ron was 27 years old and classed as a Civil Air Guard ‘starred member’ – this meant he was a certified pilot under the age of 28. 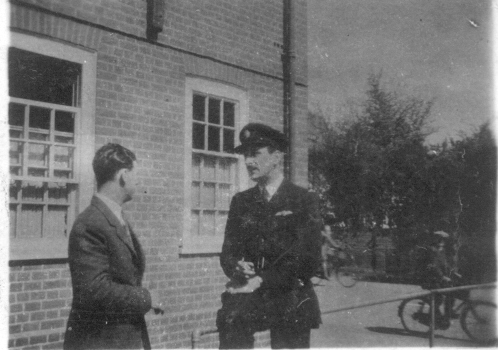 The letter from the CAG advised that “if you cannot be utilised as a pilot you may be offered other RAF employment …If you feel it impossible to accept the alternative service … your promise to serve is freely remitted.” Thus his application to join the RAF was made on a voluntary basis and he could return to his reserve occupation if he wished. Ron was not happy with being told he could not be a pilot. He didn’t want to be anything other than a pilot in charge of his own plane, the idea of not being in control of the plane himself was totally unacceptable as he wanted to be in charge of his own destiny. He waited all day to speak again with the Selection Board. Eventually the Selection Board relented and allowed him to be classed as medically unfit for any RAF work which meant he was eligible to join the new Air Transport Auxiliary Service as a pilot. Ron returned to his reserved occupation with the stone quarry and sent off his application to join the ATA. 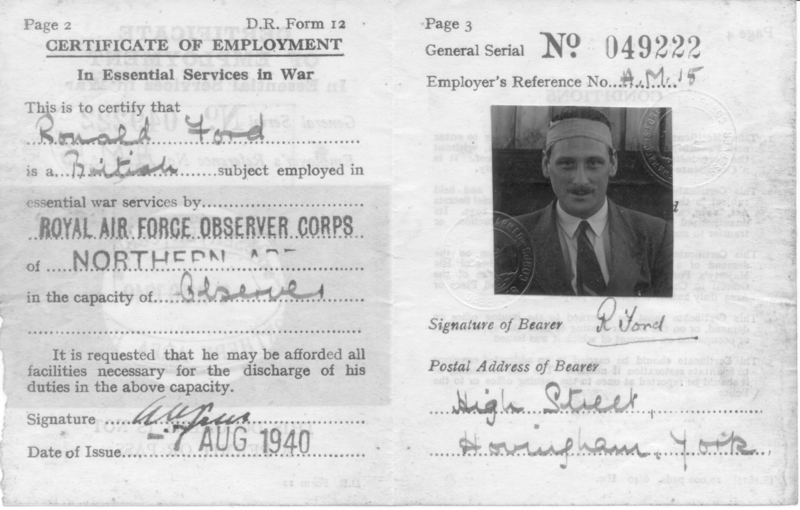 By August 1940 he was given a Certificate of Employment [No 049222, Employer Ref AM 15] in Essential Services in War an the capacity of Observer issued by the Royal Air Force Observer Corps of Northern Area. The photograph on the certificate shows him with a bandage wrapped round his head. The cause was an accident with his motor bike. A person in Army uniform veered onto the wrong side of the road and Ron’s head hit the car mirror. The Air Transport Auxiliary was formed at the outbreak of war. It was conceived by the director of British Airways, Gerard d’Erlanger, who saw that commercial flights would cease, civil aircraft would be impounded by the government and there would be pilots with no planes to fly. There would however be a demand for pilots to transport supplies, medical officers, VIPs, and planes from the factories to the RAF fighter or bomber bases. Initially holders of “A” licences with 250 hours flying time were contacted. 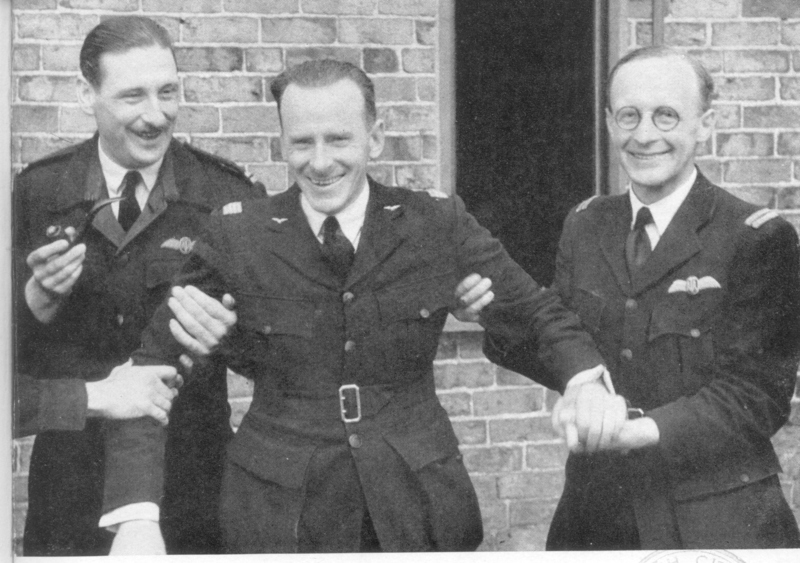 The ATA motto was Aetheris Avidi – Eager for the Air but because many of the pilots were too old or unfit for the Royal Air Force, the ATA personnel became known as the Ancient and Tattered Airmen. The ATA grew and was turned over to the Ministry for Aircraft production. The Ferry pools were sited near aircraft factories to efficiently provide a steady stream of fighters and bombers to the RAF bases. Ron initially applied to join the ATA on 24 March 1941 but at that time they were only recruiting pilots with 50 hours solo flying experience. Gradually the hours of flying required for entry crept down until Ron was eligible to join. He had to face another medical board and a second opinion was called for, but realising how keen he was, and the fact that medical requirements were less strict for the ATA, he was allowed to join. 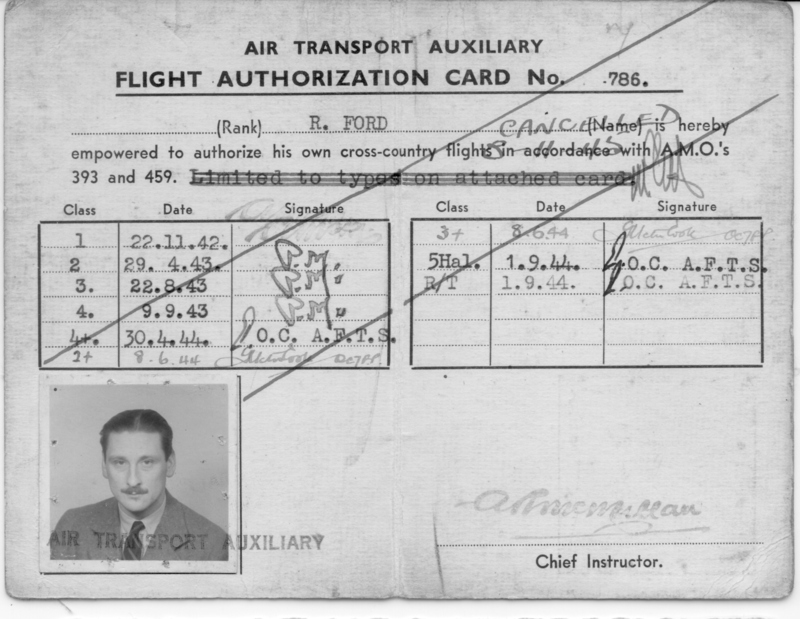 His ATA Flight Authorisation Card number was 786 and his General Record lists him as joining on 19 July 1942, age 29, previous hours flown 30, next of kin Frances Mary Ford of Croftburn, Hovingham Spa. 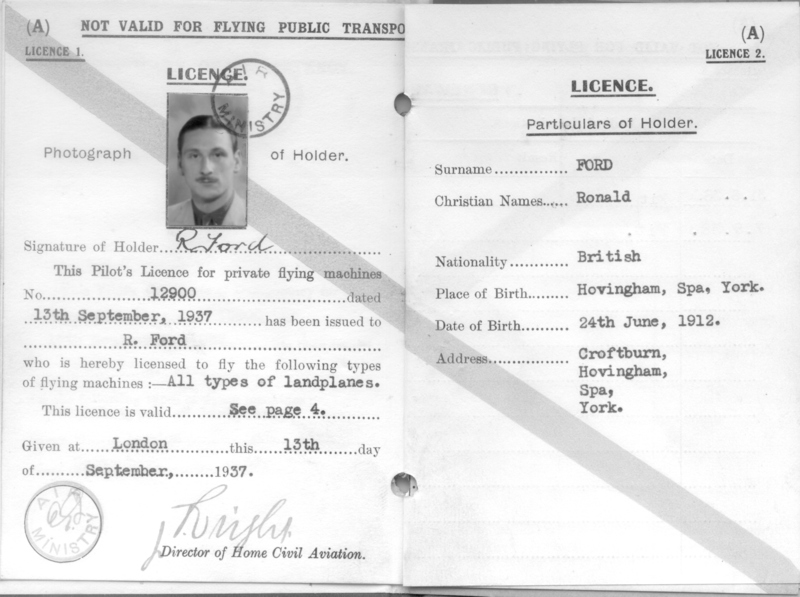 Initially Ron was posted to the Elementary Flying Training School at Barton near Luton. Accommodation was hard to find and when he arrived by train he couldn’t find a bed so he went to the Police Station and asked for help. An officer refused to put him up in the cells and took him to some digs. Ron was non-plussed when the man who opened the door was of African extraction, he had never met a person with a different coloured skin to his own, but he ended up happily staying for the few weeks he was posted there. His log book records his first flight on 22 August 1942 in a Magister. 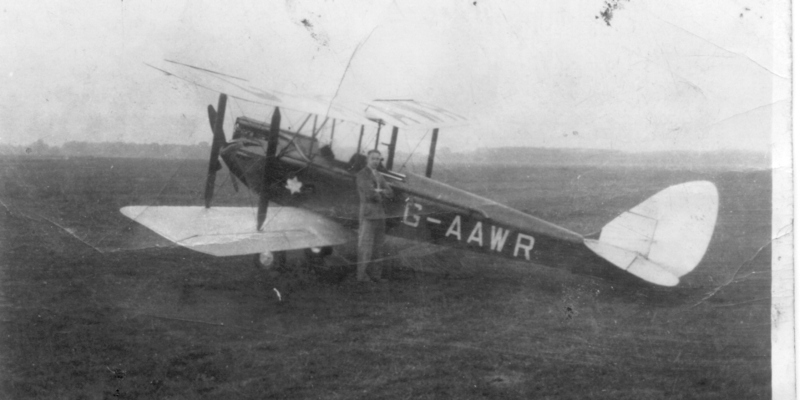 He then flew a Fairchild and did a course on Hawker Hart. By September 1942 he had started Ferry flights from the Barton-Luton base using specific numbered routes. In October 1942 he flew Magister, Hart, Tiger Moth and Fairchild. 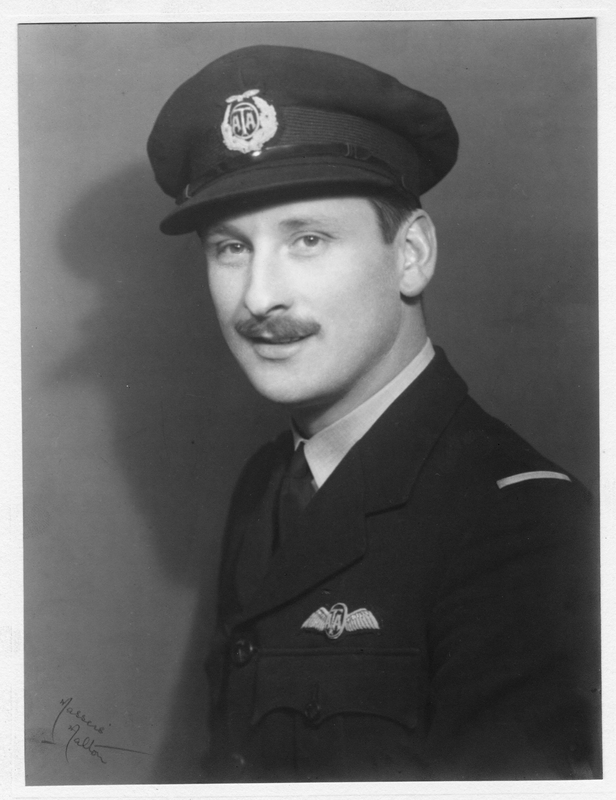 In November he was awarded his wings and the rank of Third Officer and went to Number 3 Pool at Hawarden near Chester. By April 1943 he had transferred to White Waltham for the Advanced Flying Training School and here Ron learned to fly different aircraft like Harvard, Hurricane, and Master II. In May 1943 he added the Martinet to the list and the Auster and on 22 June 1943 he had his first time in a Spitfire, the plane he enjoyed flying most. In July 1943 he was flying from Ferry Pool No 7 from Sherburn-in-Elmet. The Blackburn Aircraft Company was close by and produced many different aircraft including the Swordfish and Barracuda during the war years. This was also the closest Ferry Pool to Hovingham and he used to fly over there on his way north. Peter Bradshaw recalls that he was an Observer at this time and they used to record aircraft flying over. They used to hear the radio message come through from Malton that there was a plane coming their way and it was travelling at zero feet. Peter said they knew immediately it was Ronnie Ford and he was below zero feet for them as they were on a hill. Ron used to roar over the top of the lads working in the field and flatten them all! Several pilots including Ron were billeted with the Harrison family who lived in Leeds Road, Selby, eight miles away. Mrs Harrison was described as having Queen Anne shaped legs. She had a daughter Mavis who was only about 9 when war broke out. So the girl was not embarrassed by these tired young men who stumbled about from bedroom to bathroom, they all found one day that Mrs Harrison had carefully stitched up the fly of their pyjamas. Ron recalled that the Harrison family were something to do with shirts. In fact their Liversidge building, on Ousegate, was once the fashionable mercantile quarter of the town as Selby was an important port despite being so far inland and Liversidge had both seafaring and agricultural connections. In the Second World War it was home to Harrison’s shirt factory which clothed the British Army….. they must have made thousands upon thousands of shirts at this time. “One winter morning towards the end of 1941,” says one of the first pilots posted to the seventh Ferry Pool at Sherburn-in-Elmet, “I arrived at a remote railway station out in the desolate marshy levels of East Yorkshire and crossed the footbridge to the road. outside, where I was confronted by a very tall old open Austin car driven by a girl dressed in a leopard-skin coat, dark-blue slacks and an A.T.A. forage cap perched centrally on her head. The clouds hung low over the queer dyke-bordered lanes, and in the distance one could dimly see long vistas of telegraph poles which seemed to fringe a tangle of railway lines. In the village we called at the butchers, posted some letters and picked up three evacuee children; turning off the main road we bumped up a long track and came to a grim old farmhouse right out in the marshes. Outside, a few aeroplanes were parked, with chickens and ducks pecking around. I went up the stone-flagged path, through the hall and opened a door marked ‘Operations’. Inside was a low, stone-floored room with oak beams and a few mats. In a massive fireplace burned some logs and, sitting hunched up, chin in hands, was a Cinderella-like figure in a red jacket, with fair tumbled hair. On her shoulder sat a small black kitten. This was No. 7 Ferry Pool, A.T.A. Miss K. M. Scammell, the original M.T. driver at Sherburn who stayed with A.T.A. till the end, was primarily engaged to drive the old Austin car, but her field of operations very soon widened. Commander Victor Cook the O.C. vaguely suggested soon after her arrival that perhaps she could “knock up an odd breakfast or two on occasion.” The odd breakfast soon developed into most of the cooking for the initial group of five or six pilots. The tenants of the, farmhouse were still in residence and, at first, A.T.A. had only two rooms and the use of the kitchen during stated hours. The dining-room had to serve for meals, office, rest-room and “Operations,” but life at Lennerton Lodge was at first more or less communal. For over six weeks the ferry pilots were on no rationing system, and all food had to be obtained without cards. Endless sausages were bought in the villages and the nearby town of Selby, where Miss Scammell would also beg contributions from her friends; local farmers would contribute eggs, and when meals for the newcomers were more than usually meagre the tenants of the Lodge would generously produce slices of thick ham from their own supply. The original outbuildings included a fine old pigeon loft, but when food really began to get short, so did the pigeons, as members of the mess took to shooting down their own lunches. Most of them were successful in “winging” a bird now and then but ‘Marko’ never had any luck until one day he climbed up to the roof and stopped up every hole in the loft but one. Then he descended and sat with his gun trained on the remaining hole. The winter of 1941 was coming on, and poor Miss Scammell, becoming a little tired of the endless meals and washing up, in addition to the daily task of coaxing the old Austin into life, would hand in her notice in exasperation every few days. One afternoon things were worse than usual and everyone was a little out of temper. The C.O. accepted her recurrent resignation with fitting dignity, but as no one attempted to clear away the midday meal he shortly afterwards began to clear the table himself and was later discovered quietly washing up in the farm kitchen. This was too much for Miss Scammell who hastily went to his aid and peace was once more restored. The farm tenants found other quarters nearby, and on the day they left Miss Scammell was preparing her last midday meal. Unfortunately the removers were behind her and as she finished with each dish it was cleaned with paper and packed, until in the end the kitchen table was taken and her preparations for the meal had to be continued on the floor! 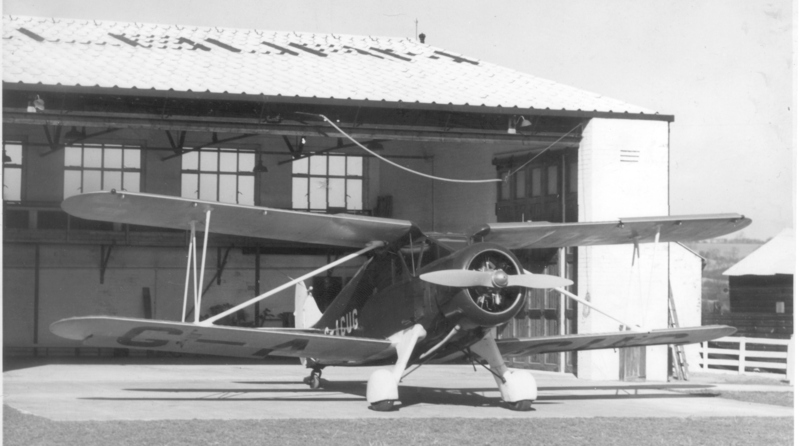 The Sherburn pilots cleared Swordfish biplanes destined for the Fleet Air Arm, and Botha bombers from the Blackburn factory on the aerodrome, in addition to Avro Ansons from Yeadon. There was also a great deal of “transit” ferrying, as the Pool was a half-way house for the East Coast route to the north. 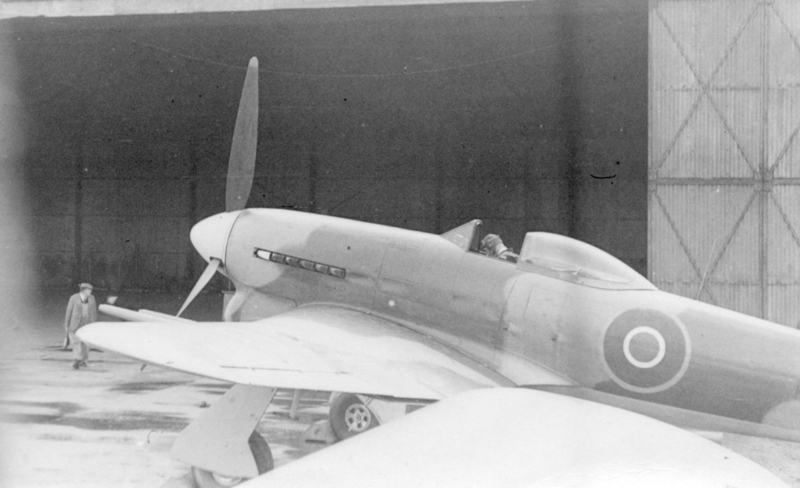 The home pilots were available to on-ferry to Scotland the Spitfires, for instance, which were brought to them from the factory at Castle Bromwich by the members of the Ratcliffe Ferry Pool. Then, in due course, the old taxi Anson would appear in the sky, circle soberly round and (before the aerodrome was enlarged) proceed to settle down on the part of the field behind the farmhouse, coming to rest among the chickens and ducks from the yard. A terrible period of discomfort followed during the construction of the mammoth concrete runways. Snowfalls, which covered the hedges bounding the approach lane, necessitated the closing of the Ferry Pool for some days, and they were followed by months when the airfield was a dark sea of mud bulldozers. Pilots were known to walk out of their flying boots leaving them fixed in the mud, while one night when the Adjutant was leading one of the M.T. vehicles through the fog his electric torch wavered and was seen no more. Led to the spot by a torrent of forceful language investigators found that he had stepped into a hole and all but disappeared. The conditions at this time contributed to the sad loss of a valued pilot. Flight-Captain Alan Colman from White Waltham, while coming in to land with a Hurricane, ran into a waterlogged patch and turned over in a pool of water over 18 inches deep. Although it took the crash crew the shortest possible time to reach the scene of the accident, the pilot was drowned before he could be extricated. The incident was a particularly unfortunate one and shows the risks pilots had sometimes to take during the years of intensive aerodrome construction in order to keep the factories clear and the R.A.F. 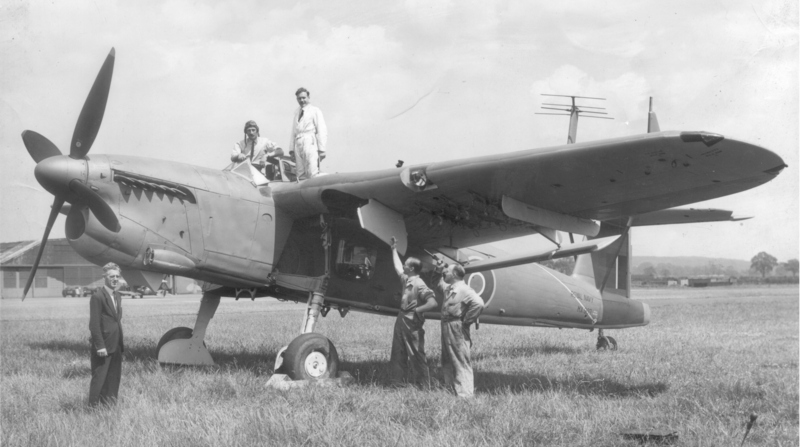 supplied without fail with the aircraft they so urgently needed. But during these difficult days there was also comedy on occasion almost to the point of slapstick, as the following episode shows. Jones-we will call him that to avoid hurting his feelings-was always a most meticulous and careful ferry pilot who liked to make quite sure that everything was all right as far as it was in his power to make it so, before taking off-but he overdid it one day. He climbed into a Beaufighter, methodically proceeded to check all the instruments and conscientiously carried out his “cockpit drill’. One or two things needed adjustment, so he had the ground crew out to put them right. At last he got everything as he wanted it, took a last look round and snapped the switches on. The mechanics stood around waiting. The ground crew threw down their spanners and danced with rage or laughter as a growing cloud of white foam began to cover the engines. Instead of the starter button, Jones had firmly pressed the automatic fire extinguisher. Dunlavy from U.S.A.-more often known as ‘Alabam’-was coming in to land one day in a Wellington but closed his throttles too soon. He discovered his mistake, but the engines failed to open up and he finished in a field some yards short of the runway in a cloud of dust. Thereafter the D.P.C. was instituted as a reminder to pilots who have damaged aircraft through their own mistakes. Another Sherburn institution was the Coffin Club. In the Mess stood a wooden money box of sinister shape into which any pilot who had, through carelessness or misjudgement, badly frightened himself, put a contribution to warn others. Bishop, for instance, after he had hit a wind sock in a Mosquito and sheared off half a wing, walked straight into the room looking more than a little green and promptly put a pound note into the coffin. Sherburn grew to be one of the largest of the Ferry Pools, and in winter or during spells of bad weather up to a hundred aircraft of all types “in transit” could be seen dispersed round the field. All of these had to be maintained and inspected daily by the A.T.A. engineering sections, and full credit must go to them both here and at the other Pools for the way they kept the machines in the air. Transport to some remote Yorkshire village, perhaps a pint at the local, and then bed. Bed and flying; flying and bed. Such was life at the A.T.A. Ferry Pools through these long periods of intensive work during the peak years of the war. But from the Pool Commander-who in most cases spent as much time in the air as his most junior pilot-downwards, everyone was happy, and the organisation lived up to its motto, the originator of which was never traced: Aetheris Avidi – “Eager for the Air”. 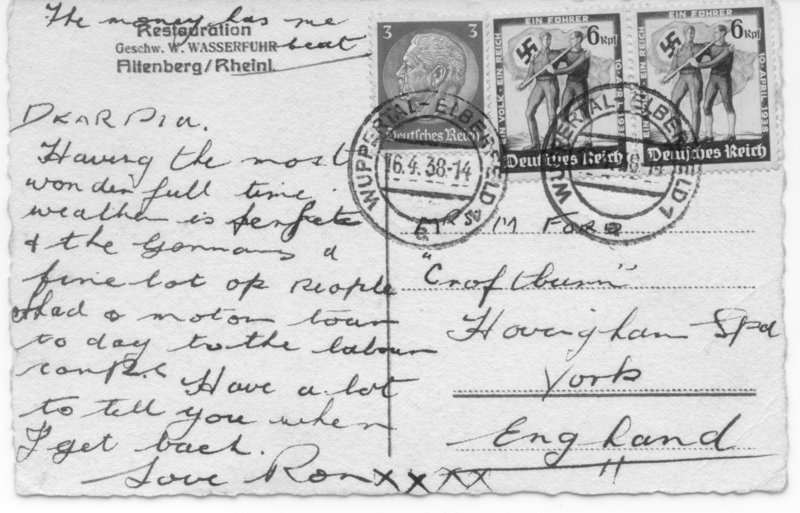 By the end of July 1943 Ron had accumulated 232 hours of flying. In August 1943 he attended a Class III [Twin Engined light aircraft] Conversion course at White Waltham flying Wellington and Oxfords. His General Record from 12.8.43 to 9.9.43 shows “Class 3 and 4 training completed. A steady reliable pilot who has made good progress throughout. A good average pupil who should be progressed gradually. Then it was back to Sherburn-in-Elmet where he was considered a useful safe pilot who carries out his duties in a conscientious manner. His discipline and behaviour is very satisfactory. Ansons and Swordfish come into his log book. In November 1943 he flew Anson, Oxford, Beaufort, Beaufighter, Hurricane, Wellington, Swordfish, Albacore and Fairchild types of aircraft and a month later had added Hampden, Whitley, Blenheim, Defiant and Martinet to the list. Barracuda were added in January 1944 and Proctors the next month. 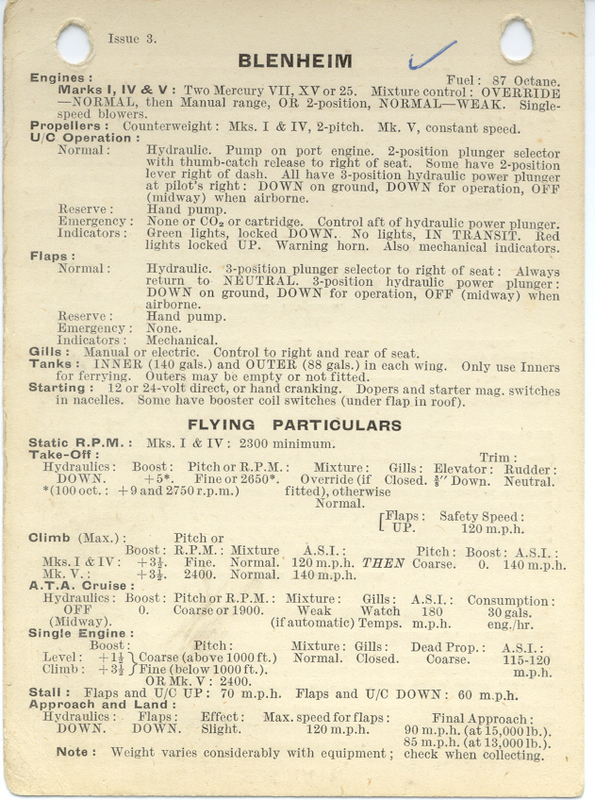 In April 1944 he is reported as being of good discipline, very satisfactory dress, pleasant and reliable character, a steady safe pilot who is keen and conscientious and has coped well with all types of class 4 aircraft. He was recommended as should have no difficulty with 4+ conversion. This led to the 4+ conversion course at White Waltham, the twin engined operational aircraft, mostly medium bombers, and Hudson and Albemarle make their appearance. The school reported he was a smooth accurate pilot whose flying and airmanship are sound and he is one who will easily adapt himself to subsequent types. A keen and careful pilot of good average ability. A good officer. Class 4+ conversion and Annual Refresher completed. By June 1944 he had over 500 hours of flying in his log book and new names of aircraft kept making their appearance. There are a couple of Aircraft Collection Chits from this time. On 28 July 1944 he was to collect a Boston III Number W8328, the consignor was Sherburn, aerodrome Walsall, the Consignee was NAS and Aerodrome Twatt and he had to hand over the aircraft to the Ferrypool at Lossiemouth. The same day he was return to Sherburn with an Oxford HN 311, the Consignor was MU, aerodrome Lossiemouth, Consignee and aerodrome was 18 PAFU Church Lawford. [MUs were small units which could be easily hidden round the countryside so aircraft were ‘scattered’ to minimise losses in the event of aerial attack]. His log book doesn’t record those flights so one assumes the reason he still had the chits was that the flights didn’t happen. On the 28 July he took a passenger in a Mosquito HR 248 from Sherburn to Bircham Newton. 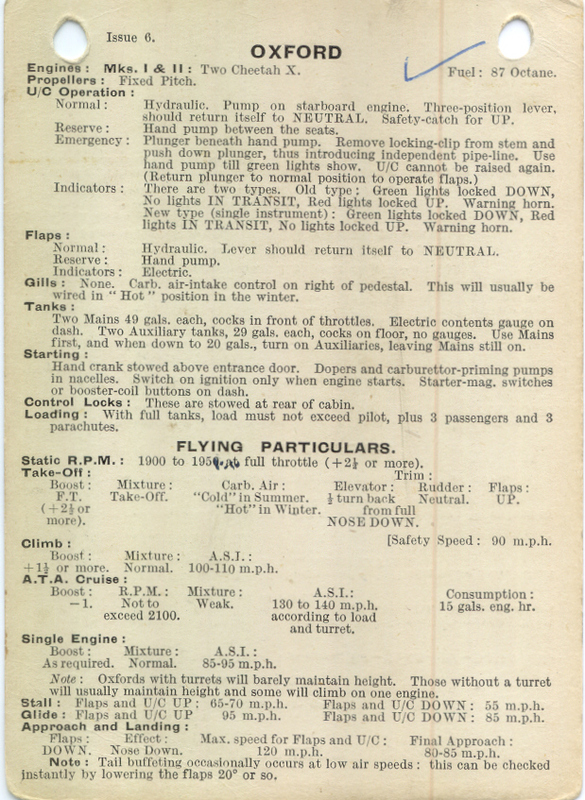 Planes had wildly differing control configurations, even those if the same class so the Ferry Pilots Notes were created and were essential for the men and women in the cockpit. They were cards six inches by four inches bound on two metal rings that contained everything a pilot needed to know about an aircraft. Settings, configurations, stalling speed, takeoff and landings. Sixty eight different aircraft are listed and Ron has ticked off all but seven to indicate he’s flown them. Thirty three different engines are listed with their oil pressures. Ron has ticked all but 5 to indicate he’s been powered by them. 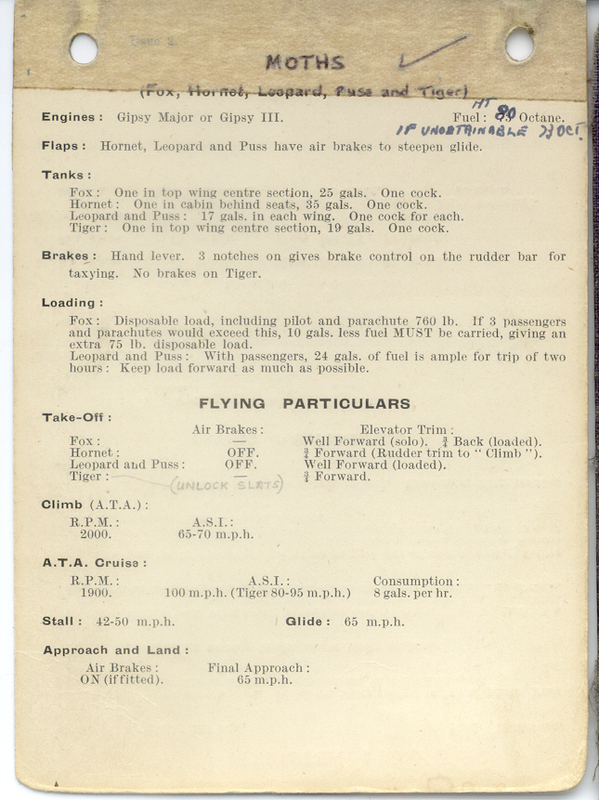 Ron’s Notes also had a few extra hand-written additions so he knew that for the Mitchell you needed to “Check intake shutters open visually before take off Keep clear of bomb door on ground.” And the Reliant “may have an auxiliary tank in rear cabin, normally empty”; the Warwick “if flap used for take off trim elevator ½ div nose down”. Ron did a lot of ferrying to Scotland as the plans for the invasion of Normandy were developing on the Banff coast. He often took high ranking passengers to and from these planning meetings. There were many Canadian personnel in northern Scotland too. Ron at the controls of aircraft T8665 which was the Master 1 he flew from Errol to Sherburn on 15 July 1944. One of his fears was thunderstorms. One day he’d tried to fly through one as his destination was just a short way past. It was a big mistake and within a second he was flipped upside down, flung through turbulence and was totally disoriented. He spotted the river to Aberdeen below and managed to get out to sea for half an hour then tried to get back in to land. The storm was still blowing and he did several circuits waiting for it to ease and for a break in the clouds to develop. He was very relieved to land safely, realising he’d overestimated his capabilities and not realised how dangerous storms are for aircraft. When he returned to base he advised the skipper to put an X next to his name… this was how they used to advise the pilots that one of their friends had come down and been killed, the sign that he or she was not coming back. One pilot who lost her life was Amy Johnson. She was remembered with appreciation by other pilots who remarked “It mustn’t have been easy for Amy at first, to submit herself to all the discipline and the flying tests and be just one of the crowd. Some of the crowd used to rag her too and try to take a rise out of her. That’s the penalty for being famous I suppose. But Amy took it all in good part. She just got on with the job and the tragedy of her loss was that she was obsessed with the feeling that because of her record braking flight she ought always to be prepared to fly in any kind of weather and take greater risks than anyone else. She wouldn’t admit that the weather can defeat any pilot sometimes.” Perhaps the finest part of her record was that she was prepared to go back to the beginning and be anonymous again, one of a host of pilots. where always before all the limelight had been on her alone. I decided to stay underneath it if I could, and crossed St. Andrew’s bay just above the waves in almost zero visibility, reflecting that I had just completed 500 hours in ‘twins’, the war was nearly over, I should be going home soon and this, in the current phraseology, was a bloody silly thing to be doing. As I approached land I had visions of church spires and wireless masts lying in wait for me and climbed up through the murk and drizzle, coming out on top at about 1200 feet. Soon I saw the Firth of Forth and my destination, with fog right up to the boundary on the landward side. I made my circuit half on instruments, plunging in and out of the fog, and put down on the first runway I saw. There were no signals out, and although they gave me no encouragement, they didn’t actually shoo me away. Ron was probably holding them down. I taxied in, picked up Ron, stood not upon the order of our going but took off again like a scalded cat. I had never broken so many regulations all in one go, but taxi-pilots were allowed a good deal of latitude by our own people as long as they got the others home. A pilot in the hand was worth two stuck out for the night. Making the usual clock-wise circuit, we disappeared into the fog, but soon emerged and as we set out across the Forth, Ron looked back and called my attention to the most wonderful display of fireworks. The Navy, which had very sportingly allowed me to gatecrash, was now signifying its official disapproval of the whole business by firing off every red Verey light it could lay hands on. They looked very pretty against the fog. Ron was a tall, dark man with a moustache who, unlike most of us, really looked like an airman, and that same summer he and I were again involved with the fog. This low-lying sheet of mist, creeping in from the sea, was an east-coast speciality and we had been warned to take it seriously. Sometimes, flying home on a summer evening at eight or nine o’clock, one would find it spread over the whole vale of York, with a few detached trees and church- spires apparently adrift from their moorings and floating about in a calm, pearly sea. It was the most peaceful sight imaginable, and the pleasure was sharpened by a small, nagging doubt as to what one would find at one’s destination, which might or might not have been reported clear before one started, and as to what would happen if the engine stopped. In fact, I only had three partial engine failures and never a complete one in all my four years’ war-time flying. Sometimes in summer we had a long spell of this weather, which could be very tiring as it would be tea time before the ground beneath got warm enough to lift the stuff to a height of two or three hundred feet, so that you could creep in underneath it to your destination. You would then start out on a 6oo-mile trip, getting back at about ten p.m. with the last of the daylight. As we reported for duty at nine in the morning and hung about all day, a few weeks of this sort of thing was exasperating. On this particular morning, three of us were handed ‘chits’ to take Mosquitoes to Banff, on the Moray Firth; and Ron, who had a Warwick to Kinloss, was to pick us up on his way, take us on to Kinloss and bring us back in an Anson. The cunning thing in this weather was to postpone your departure to the last possible moment which would allow time to make the trip out and home. There was then the best chance that the fog would have lifted at your destination. I was the last of the party to start. One pilot put down south of the Firth of Forth and called it a day, the prospects at the other end being extremely poor. But when I met the white tablecloth, I carried on over it by dead reckoning in the comfortable knowledge that I had six hours’ petrol for what would be, at most, a four-hour trip (if I had to turn back) and that the Mosquito flew very well on one engine if the rare engine-failure should choose that day to happen. Inland of Aberdeen, I could see the Grampians sticking up out of the mist, most beautiful, and then I caught up Ron in the Warwick, and we waggled our wings in greeting. Ron altered course inland for Kinloss, but I continued in a straight line for Banff which was well out east, towards the open sea. It was on the coast, and I had a hunch that the uneven heating of land and water might cause a rift in the cloud, so that I could get underneath it and land. This was, in fact, what happened. Just as my watch told me that I should have reached my destination, I saw a great crevasse in the mist, with the sea not far below, and came down through it. I recognized the coastline about three miles from Banff, and was soon sandwiched between the cliff-top and the cloud with about 200 feet of air-space in which to make my approach and landing. I liked bringing in Mosquitoes from 1500 feet in a steep approach with very little engine, and hated the sort of chimney-crawling which is standard airline and jet technique and which the circumstances of that day required. But I got down all right and found myself the only one of us to arrive. The secret, in fact, was good timing. The other two Mosquitoes had started too soon and had to land elsewhere, but after lunch Ron turned up in the Anson and we started home again. The dear old Anson was a much slower aeroplane than the Mosquito and we were over the top of the stuff for an hour going south. It was very beautiful, glistening and wavy like a great snowfield as we trundled drowsily on into the westering sun. The landscape was rather like heaven anyway, so we were startled when we suddenly saw three large crosses sticking up out of the mist. The wireless masts at St. Abb’s head are very pretty seen that way, and soon afterwards we cleared the mist and flew on over open country. Sherburn was a happy pool, and I was happy there, and although a few other women were posted to it in the last months of the war, there was a sufficient preponderance of men to prevent it getting schoolgirlish. I saw little of the others off duty, because, in fact, we had very little in common outside of flying and most of the men wanted a different kind of feminine companionship. The greatest friends I made during the war were not in A.T.A. Non-flying friends in the neighbourhood, and the love and kindness of the people with whom I was billeted, prevented me from being lonely. Tom Lapraik was the person at Sherburn who was in charge of all the organisation to allocate where pilots went, which planes needed to be collected, where they had to go, which pilots needed return trips and what other passengers had to be taxied from place to place. Ron recalled he was very efficient and only the weather would put a spanner in the works. Ron recounted another incident with Mary de Bunsen. He was to pick up eight passengers to return them south. They were reluctant to leave the Mess but Mary said if they were not on board in 2 minutes they would be left behind as the weather was closing in. She acted as navigator and they were relieved to see the three chimneys at Tadcaster, local knowledge getting them home through the fog. Golf was one of their social activities when they had time. The gang were called the Coke Hammer Brigade and they played at Pannel, Fulford, York and Sandmoor. One participant was the Ferry Pool Commanding Officer and another was a pilot called Ron Maxey. One day Ron and Maxey were flying Spitfires back from the north of Scotland. Maxey asked him if he could ‘formate’ as he was having difficulty concentrating. Ron agreed as long as he didn’t come in too close. In the Newcastle area there were many pylons and wires all over. Ron suddenly realised Maxey wasn’t on his wing. He’d lost him. He started a slow turn and spotted Maxey going down through the maze of pylons and wires. He belly landed in a cloud of dust, hitting a railway embankment and breaking off a wing. Ron saw him eject the canopy and climb out as twenty civilians rushed over to help. Someone had signed Form 700 to say everything had been checked but they had failed to check the line filter into the header tank and it nearly cost Maxey his life. 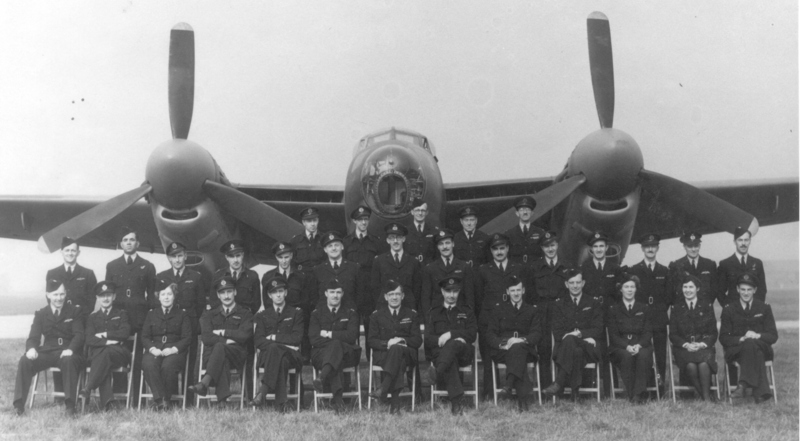 By August 1944 Ron attended the Class 5 Halifax conversion course at Marston Moor. He was noted as being a good average pilot who proved an efficient pupil showing every interest and capably absorbing knowledge. His drill was good and he co-operated well with his Flight Engineer. This course was for four engined heavy bombers and Lancasters started to be listed in his log book and many more joined the list over the next months. Freddie Weeks was his flight engineer. His father was African and his mother was English. Despite Ron’s reaction to his Luton billet he was happy to work with Fred and the two became great friends. Fred had survived a fire and crash with another pilot in a Catalina. His parachute had the release pins blown out so Fred couldn’t pull the pin to get it to open. Luckily for him the small ‘chute did open and pulled the big one with it and he survived. Fred refused to sit up front if the weather was ‘duff’. He’d retire to the back of the plane because he didn’t want to see himself die. One day whilst flying a Lancaster an engine caught fire. Ron called Fred who bounded up and both of them went through their emergency fire procedure. Fred ordered Ron to get his speed back to 120 knots and then applied the liquid spray over the engine. It didn’t go out immediately and they knew they had just a couple of minutes before the magnesium alloy wing spars would burn. Ron looked for a spot to land and circled round. The engine fire was extinguished and they were able to fly onto their destination. The fire had been caused by the reduction gear behind the prop seizing up and the aluminium had melted. One day Ron asked Fred to check the bomb bay of a Liberator he was flying by going along the middle cat-walk. He then opened the bomb doors. Poor Fred was left clinging to one of the spars inside and standing on a small piece of aluminium. Despite these pranks he and Ron became great friends. By October 1944 Ron was listed as being of good discipline, very satisfactory dress, pleasant and reliable character and a steady and safe pilot who has proved reliable and thorough on Class 5 aircraft. Ruth Russell recalled He was a senior pilot and I think a good one, and popular in the mess. Ruth Russell was a late entry to ATA having volunteered in early 1944 from a commission in the WAAF as a meteorologist. Unfortunately she was in a serious crash caused by the instructor before she even soloed, so it was late in the war when she was posted to Sherburn and joined Audrey Morgan sharing her room in the only pub 5 miles away in Ulleskelf, the Ulleskelf Arms. 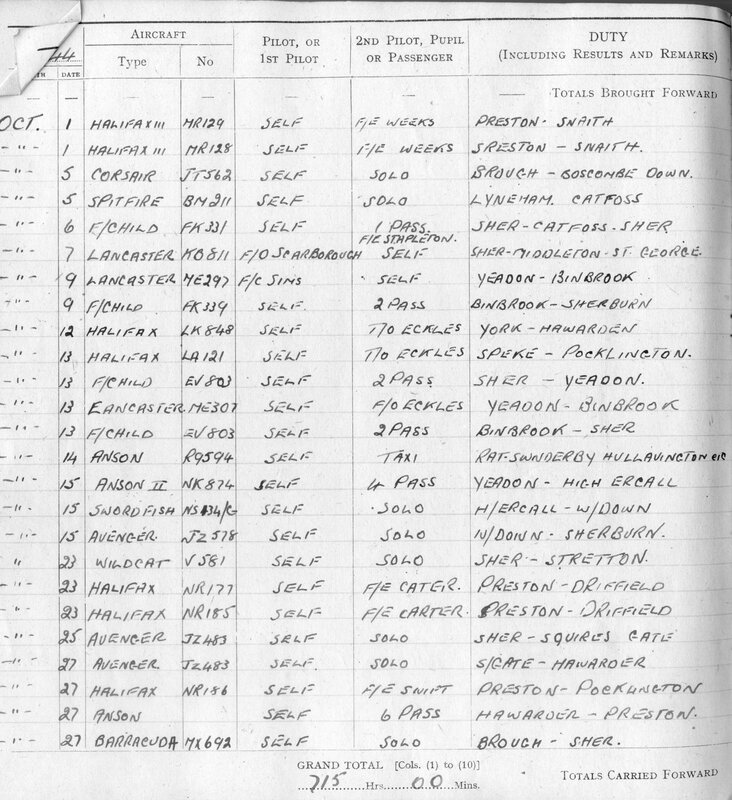 By April 1945 Ron’s General Record listed his hours in each aircraft, there were 43 different ones listed. The General record does not include anything from 7April 1945 until his final discharge from the ATA.. I only saw Ron again at a meeting early in 1947 with his wife and a baby. 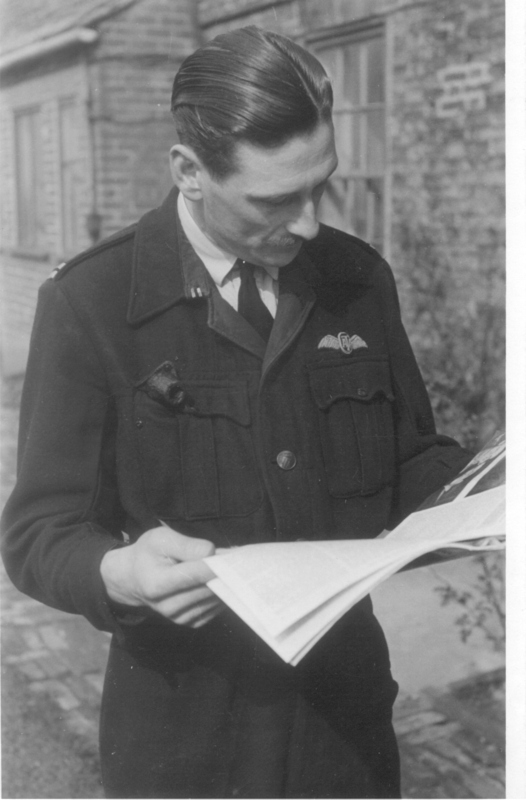 According to his log book by 9 October 1945 Ron had accumulated 1951 hours of flying time and over 40 different types of aircraft, mostly flying out of Ferry Pool No 7. For the remainder of October he spent some time with FP No 6 based at Ratcliffe and his last recorded flight was on 30 Oct 1945 when he took Fairchild FK 343 from Ratcliffe to Silloth. The General Record does not note the dates when he was promoted to Second Officer and subsequently First Officer. The final comment dated 11.10.45 records Ron was a very capable pilot who has done valuable work in the Pool. Ron’s Ferry Pilots Notes have over 60 different types of ticked off. His log books look as if they were not completed for every flight, but done in neat batches and he may have missed some in his summary. His log books don’t show any landings at the Canadian base at Wombleton aerodrome near Hovingham after it opened on 21 October 1943, but he used to land there when he could, organise the RCAF to give him a lift into the village, then stay the night with his family; the local taxi-driver “Old Swan” would take him back out to the aerodrome the next day. Initially the base was used by the RCAF as a bomber base but the runway was below standard for the Halifax and Lancaster aircraft with a full bomb load, so it was subsequently relegated to use as an HCU [Heavy Conversion Unit] for training and bomber practice. 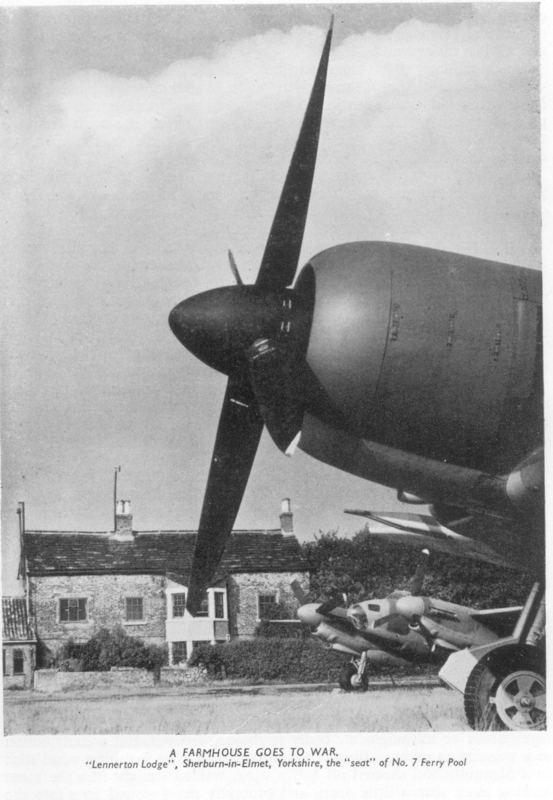 David Brown wrote Wombleton (3 miles east of Helmsley) which was near to the pre war grass airfield of Welburn Hall was in the closest proximity to the North Yorkshire Moors which arched to the south west and north east some 5 miles distant and reached a height of 900 feet. Beautiful common land and woodland was wantonly destroyed and “Moorfields” farm was demolished during the construction by Carmichaels and Miskins of this temporary standard bomber field. Many an illicit ‘bob’ was made by sub contractors operating slack practices. Unwanted wheel barrows and tools were later excavated from under the concrete runways. Wombleton was just within Air Ministry specification when selected as an operational airfield due to being so close to Sutton Bank. Later experience proved that it was below standard for Halifax IIs and Lancaster BIIs to take off when fully laden with a full bomb load and it was relegated to HCU status for training and bomber practice. 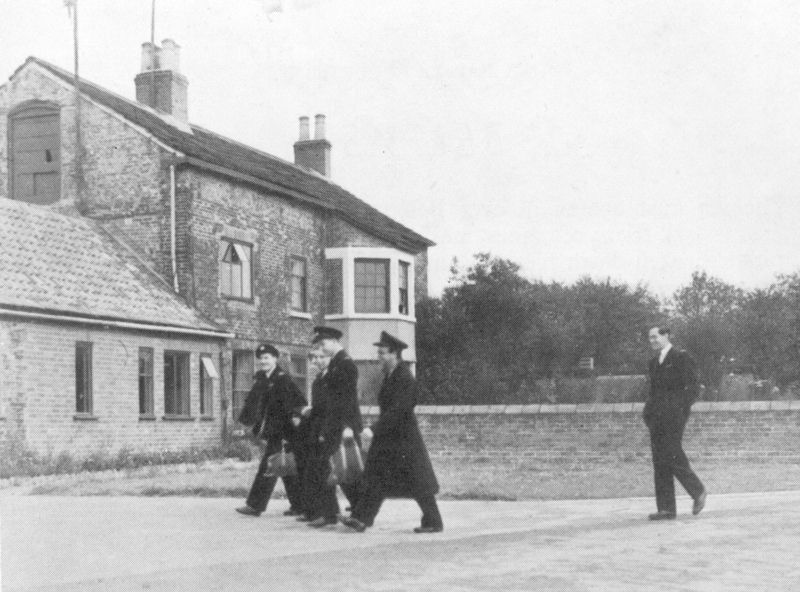 Living quarters were sited on the Nawton side of the airfield and the WAAF site along the Nunnington Road was lived in until recently. The COs house is now Agars’ mortuary. Just before Wombleton opened on 21 Oct 1943 crates of ICs were dropped by the Luftwaffe most of which did not explode and grass on the airfield was set on fire. Land reverted to the original owners Mr Wass of Wombleton Grange and Moorfields and ‘Kings’ of Wombleton soon after the RCAF vacated. It was used by 6 Group (RCAF) Bomber Command as a training base, not a base from which operations could be undertaken. My mother remembers there was quite a bit of controversy about the aerodrome because there was a move to upgrade the local roads to take bigger trucks to upgrade the runways, at enormous expense of course, but it never eventuated because the war ended. Table 1: the month a new aircraft was introduced into Ron’s log books. Thus according to my calculation he flew 52 different aircraft types whilst with the ATA, a phenomenal record. In the back of “Brief Glory” he has ticked off the following types in addition to the ones I have listed:- Battle, Blackburn B2, Gladiator, Roc, Walrus, Wicko, Botha, Douglas, Expediter, Havoc, Marauder, Meteor, Ventura, Fortress. I can find no record of his flying these aeroplanes unless they are known under a different name; for example the Ferry Pilot Notes lists the Boston and Havoc as D.B.7 variants and the Fairchild is under Argus. In addition to the ATA planes he flew three different types before joining, so in total Ron flew 55 different types of aircraft, something that could probably only happen in war time and only in that particular war. These years were dynamic and challenging times when new types of aircraft were regularly being produced as resources were poured in to the war effort. Ron flew more than 50 types of aircraft in those few years, many times being asked to take off in a type of plane he had never flown, with only a short briefing and a small page of handling notes. 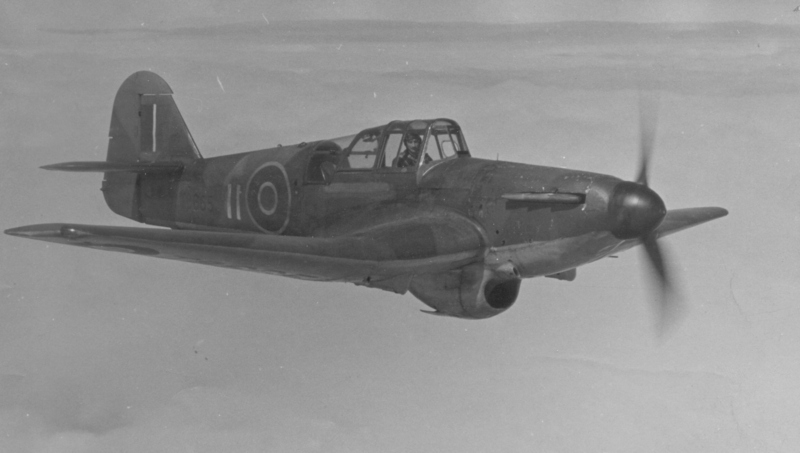 This was unique, in that RAF pilots specialised in one or two types and in later years training requirements would make it impossible to operate so many different aircraft. Navigation was an awesome job as they had no electronic aids, frequent fog and mist, often no radio and power blackouts. Railway lines main roads and rivers were the most important features on their maps. Ron used to recount the story of waiting for the Flying Scotsman train which steamed between London and Edinburgh. The pilots would circle in wait and when the train had cleared the bend and had a long straight run ahead they would race it along as the fireman desperately stoked the fuel and the passengers would peer out the windows, then they’d flick the planes over to the other side and the passengers would race to those windows to watch. Ron had some lucky escapes and no doubt was lucky to survive these years, but it had a lot to do with his thorough attention to detail and knowing the limitations of himself and his machines. He must have been respected as a top pilot because when the weather was marginal, he was the one who was asked by the Commanding Officer to fly to Scotland to pick up the whisky for the Officers Mess. He’d fly north to Prestwick and take a taxi into the Bond House in Glasgow, collect the whisky then taxi back to the aircraft then fly home to Sherburn. – they knew he would get there and back safely through the fog if it was humanly possible. Ron about to take the last Barracuda that was built, from Brough to Sherburn. It was 22 June 1945 and the aircraft’s number was MX607, destined for the Royal Navy. After the Normandy invasion, which started on 6 June 1944, male ATA pilots flew Spitfires to support the RAF and Ansons to ferry passengers, military personnel, medical teams, ammunition and small arms, radios, fuel, spare parts and food went over and freed PoWs, orphans and wounded soldiers were ferried back. Ron spoke of this work just once. He recounted how the jerry cans of petrol were thin square ones and there were so many packed into the plane that you had to climb in through the window. He said they brought high ranking German PoWs back. He said they never carried a revolver as it was assumed the prisoner wouldn’t try to attack the pilot as it would cost everyone their life if the plane went down. In 1972 he was interviewed by Eversley MG Belfield, a Senior Lecturer of the Department of Extra Mural Studies at Southampton University but I have never been able to get hold of the transcripts. 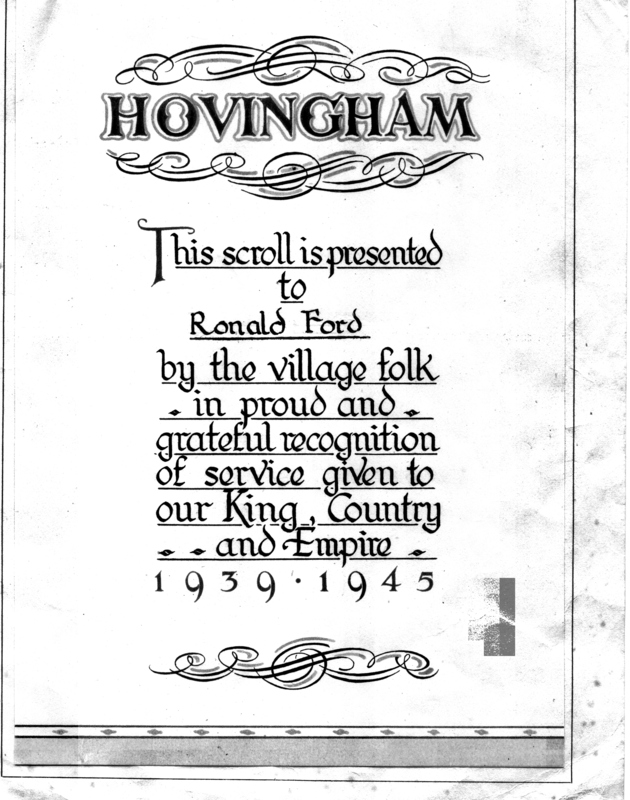 After the war the villagers of Hovingham presented each of their returned servicemen with a scroll “In proud and grateful recognition of service given to our King, Country and Empire”. Ron often recalled his flying days with fondness and said that as a pilot you were in charge of your own destiny and didn’t have to rely on others. If you overstepped the mark or overstepped your capabilities you were killed. This very appropriate poem, by John Gillespie Magee, a young pilot who was killed in an aircraft accident in WWII, was read at Ron’s funeral in 1999. I found the page regarding your fathers ATA service of great interest. I am carrying out research for a proposed book regarding the ATA and I was wondering if you have any photos from your fathers collection taken during his service with the ATA? Caroline, have you come across one of these silver ATA badges in your research? Sorry Mark but I haven’t seen them…. I wonder when they were first issued as I know the service medals didn’t come out until after my Dad’s death so I was unable to obtain one… perhaps they were able to keep and wear their ATA badges or caps at occasions like Remembrance Day and the women had those too….???? Thank you for replying. I shall continue to search. I think you should be able to apply for the award regardless of when they passed away. Kind regards Mark. Email me, i have an original fully signed copy of that group picture in front of the mosquito. Your father must have been front of the queue because his signature is smack in the middle, you cant miss it. I grew up with a Ron Ford in the village and he always said it was not him. Now I know. I also have my fathers log book, so i will flick through and see if they flew together, my father is 2nd from the left standing. Which is your father? Sorry I had not read the article, i just happened upon the picture. Great information in there. I live in Beverley, pass through Hovingham a lot and are friends with the current land agent there. The reason for the search that found the picture is that I am just doing a presentation on Africans in East Yorkshire.